What happened at Flanders Fields? What is the story of In Flanders Fields, the poem? Where is Flanders Fields located? What are the words to Flanders Fields poem? Students, teachers and educators have been reviewing these and other questions for over nine decades to explore the story, the meaning, the message and the history behind John McCrae’s In Flanders Fields poem, the most famous and beloved of all Remembrance Day poems and war memorial poems. 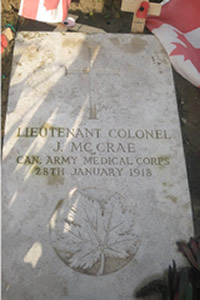 2008 marked the 90th anniversary of the death of Lieutenant Colonel John McCrae. The year also marked the 90th anniversary of the end of the First World War. The In Flanders Fields Song and the FLANDERS FIELDS Educational Kit – 6 Lesson Plans for Teachers were created to commemorate both, paying tribute to our veterans and signifying our commitment to the memory of all fallen soldiers and a recommitment to Remembrance and global peace. How did John McCrae come to write the In Flanders Fields poem? What experiences and events prompted McCrae to write this war memorial poem while still at the battlefront? How did the Flanders Fields poem manage to get published? How was the poem used during the war and after the war? What inspired composer Anthony Hutchcroft to compose the music for the Flanders Fields Song? What compositional elements were used to interpret the imagery and contrast of John McCrae’s In Flanders Fields poem? How did the composer reflect John McCrae’s Scottish heritage and military background in the music? The In Flanders Fields Song is available on CD or as an MP3 download. The Flanders Fields Lesson Plans were created to help teachers and educators engage their students in Remembrance Day activities and are designed as social studies curriculum support for grade school students. The Flanders Fields Educational Kit can be purchased online through this website. In Flanders Fields sheet music and choral arrangement are available for download as pdf files. The inspiration behind the haunting In Flanders Fields music video was taken from the black and white photo of crosses “row on row” in Essex Farm Cemetery, where John McCrae’s friend Alexis Helmer was buried the day before McCrae composed the In Flanders Fields poem. The photograph of Essex Farm Cemetery was reportedly taken shortly after the end of WWI and this Remembrance Day video offers a visual representation of the stark imagery utilized by John McCrae in his In Flanders Fields poem. The In Flanders Fields video can be purchased online through this website. John McCrae was born in Guelph Ontario on November 30, 1872 and succumbed to pneumonia and meningitis in France on January 28th, 1918 while serving active duty during World War I. Although mostly recognized as the author of the In Flanders Fields poem, in his short life there were many other John McCrae accomplishments; as a physician, teacher, author, poet, soldier and military leader. Exactly what was the significance of the First World War? Along with a WWI Chronology and WWI Statistics, you’ll find a brief outline of WWI from the Serbian & Austro-Hungarian conflict and the assassination of Archduke Franz Ferdinand to the Armistice Day treaty of November 11th, 1918. Some of the areas covered include the countries involved in WWI, alliances, the Christmas Truce and the military firsts that made WWI a new kind of war.